Mint Watermelon Margarita is a super fresh happy hour cocktail. Made with fresh lime juice and agave nectar, it is a skinny margarita too. 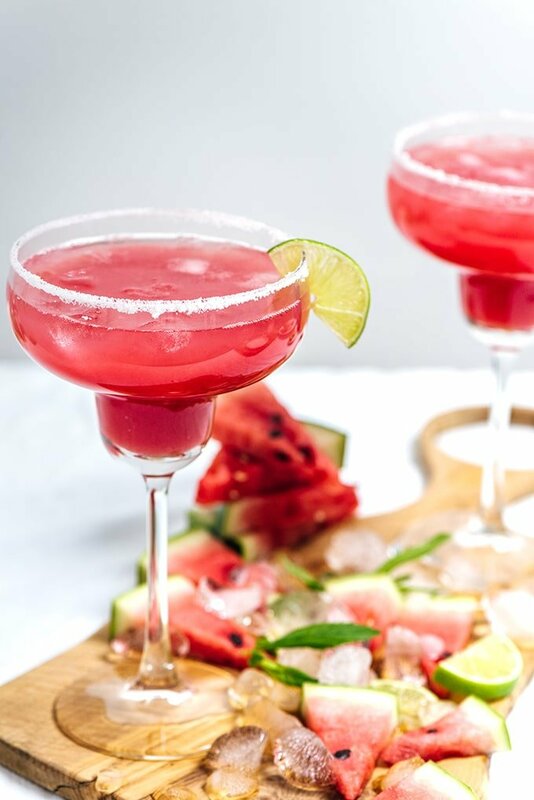 This Mint Watermelon Margarita is a wonderful combination of sour, sweet and salty flavors. Besides fresh watermelon and lime juice, this cocktail has fresh mint sprigs, thus it becomes the most refreshing margarita ever! 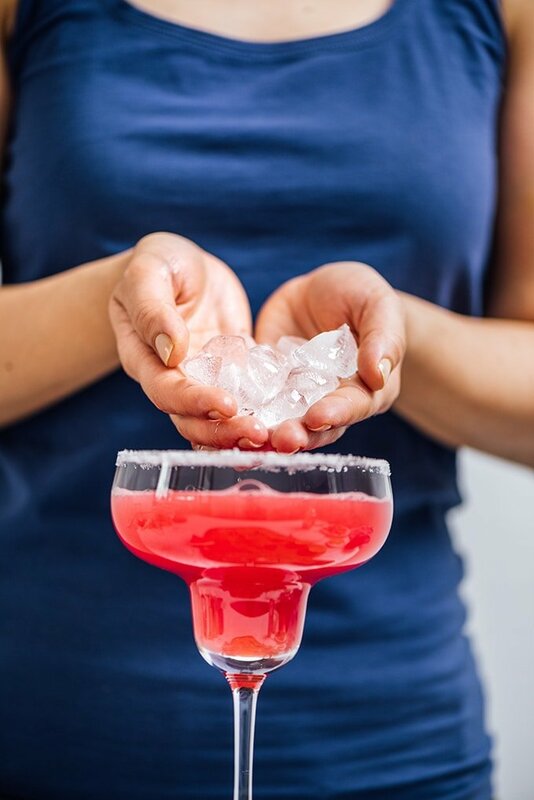 Unlike a classic margarita, this one doesn’t have triple sec or cointreau, which resulted in a skinny margarita recipe. No orange juice either as I didn’t want the strong flavor of orange. I used agave nectar instead. To be honest, tequila is not my favorite drink when served in the traditional way. You know, I’m talking about licking the salt on your hand below the index finger, downing the tequila shot and quickly biting a lime wedge. What I don’t like about tequila is the downing shots method. Just not my type of thing. I love sipping my drink and that’s why my all time favorite drink is Turkish Raki (I need to prepare a post on this amazing drink –hopefully some time this summer). Back to this post, I can proudly say that this Mint Watermelon Margarita is perfect to sip too. Also, it takes me to summer, which means no work, relaxing with your loved ones on the beach and enjoying the sunny weather all day long. It’s not summer yet, but I couldn’t resist when I saw the first watermelon of the year at the market. It’s one of my absolute favorite summer fruit, so you can imagine how I gobbled a big slice of it once I came home. After having half of it in my favorite way (read it as watermelon+feta), I started to think of using up the other half to make a cocktail. 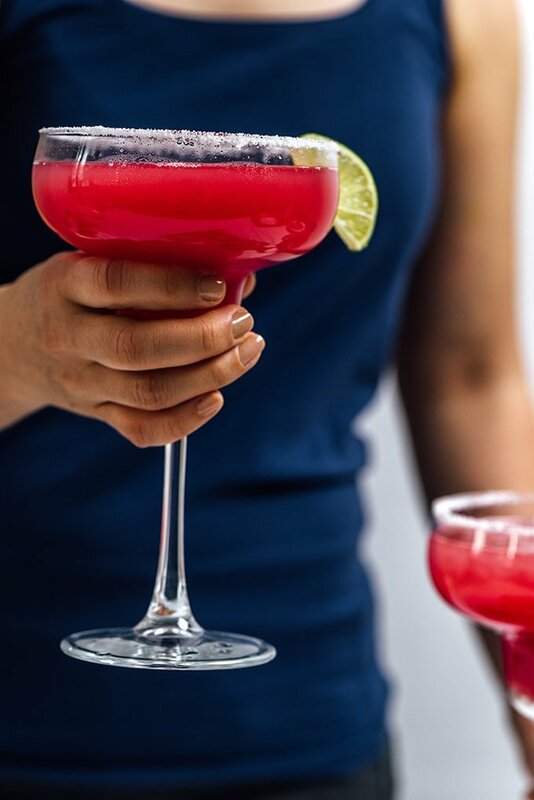 I love trying new combinations to make margarita as in this Fresh Strawberry Margarita, which would be perfect for any spring celebration. It’s already one of my favorite cocktails but I couldn’t help thinking of the combination of watermelon and mint in a margarita when that half watermelon on the counter was looking at me. So that’s how this Mint Watermelon Margarita happened. I used the shaker just to combine lime juice, tequila, mint sprigs and agave nectar with ice. I added the watermelon juice right into the glasses. Lots of ice is a must in my cocktails, so I added extra ice cubes into my glasses. However, this makes the drink a bit waterier. If you don’t want this, just make sure your watermelon juice is cold enough and don’t put those extra ice cubes. Alternatively, you can chill the juice in the freezer for 10-15 minutes beforehand. Adding mint springs in the shaker is important. Either chop them roughly or tear them before putting in the shaker. When combined with the other ingredients in the shaker, their flavor stands out more. Much better than placing the sprigs in glasses. I made this recipe as the part of Margarita Week, organized by Hola Jalapeno to celebrate Cinco de Mayo next week. Go check out her round-up to see the other amazing entries of some amazing bloggers. Cheers! 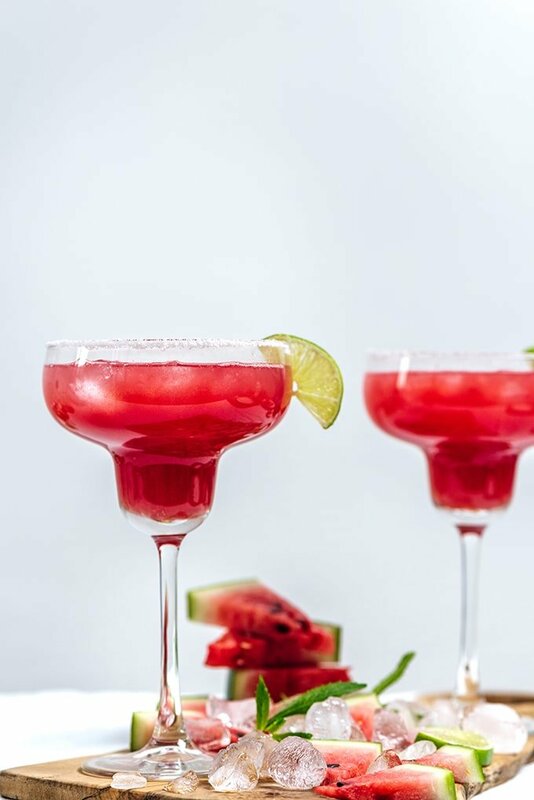 A fresh and skinny margarita recipe with watermelon, lime juice and agave nectar. Perfect to celebrate Cinco de Mayo! To make the watermelon juice, blend watermelon cubes in a blender until smooth. Strain out the pulp using a fine mesh strainer. Run a lemon wedge around the edges of your glasses and dip it into salt. Fill a cocktail shaker with ice. Pour in the tequila, lime juice, agave nectar and mint sprigs. Shake for 30 seconds. Strain it into your rimmed glasses. Pour watermelon juice over the glasses and add extra ice cubes in the margaritas if you like. Place a lime wedge on each glass and serve. This is so beautiful!! I imagine I’ll be sipping on these all summer long! Thank you for contributing your recipe to Margarita Week. Cheers!! Thank you Kate! I’m happy to be a part of Margarita Week! Cheers!